Scientific Name: Order Araneae, family Theraphosidae, Aphonopelma spp. Identification: Large, hairy, light to dark brown spiders; distinctive and hard to confuse with other spiders. Biology and Life Cycle: Males have longer legs and are more active than females. Males mature in ten or eleven years and don't molt after maturity. Females continue to molt and live twenty-five to thirty years. Neither males nor females are sexually mature until ten years old. Habitat: Protected areas in drier climates. Feeding Habits: Nocturnal. Hide during the day, hunt by touch in the dark. Eat insects, lizards, and other small animals. Economic Importance: Control of troublesome insects. Not dangerous. Natural Control: General biodiversity. Tarantula hawk, which is a large wasp (also called pepsis wasp). Organic Control: None needed. Tarantulas are beneficial and nonaggressive. Insight: The tarantula's bite is no worse than a wasp or bee sting--but they seldom bite. They make good pets. 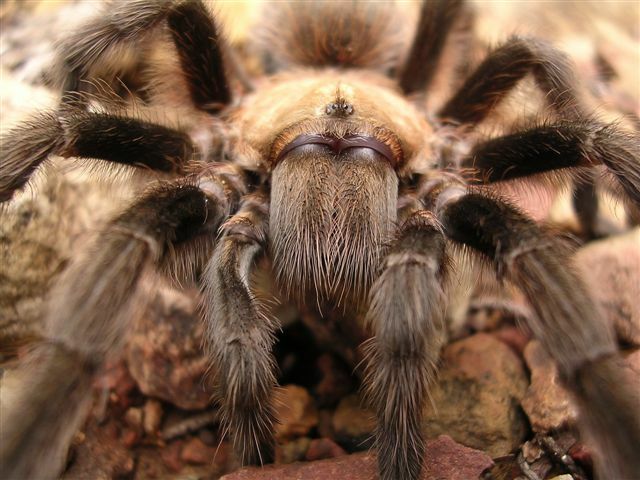 Tarantulas eat very little and don't bring fleas into the house. There are no vet bills, they don't bark or wet the floor or tear up furniture.